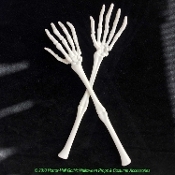 Each pair set includes 2 ghost gray off-white color hard plastic skeletal hands on bony forearms, both LEFT and RIGHT. Total length approx. 13.5-inch (33.75cm). Each skeletal hand is approx. 4-inch (10cm) Long from wrist to finger tip x 3-inch (7.5cm) Wide. Arm bones each approx. 0.75-inch wide at the widest part. Size: approx. 13.5-inch (33.75cm) Long.